Yes, I am an unapologetic fan of Tom Baxa's work. Reading many of the blogs and websites out there, not many people enjoy his work, especially in roleplaying games, but - in my opinion - he is a great artist and quite a mood-setter. Allow me to illustrate. I believe art is important to setting the tone of a roleplaying game. It may not be as important as its contents, but its importance cannot be denied. Art sets the tone of the game, it illustrates hard to describe creatures, it depicts parts of the world and important scenes. This is why I enjoy the earlier works of TSR such as AD&D, and the works of Erol Otus, David Trampier and David Sutherland, among others. I even think some works are as much defined by art as by content. Two of such works are Planescape and Dark Sun. I first saw the images created by Baxa when I purchased a copy of the Dark Sun boxed set (1st edition). Some of the interior art was Brom's but it was Baxa's rough depictions of Athasian people and creatures that drew me in. It perfectly captured the mood of the game for me. I know I may be the minority here, but his black & white drawings, hard, thick lines and edges, show me what Athas is all about: a savage, violent world where only the strong survive. There is something raw and primordial about his Dark Sun drawings, some element of grittiness that left an indelible mark on the setting. Some of it is even reminiscent of certain Marvel authors of the 70s. 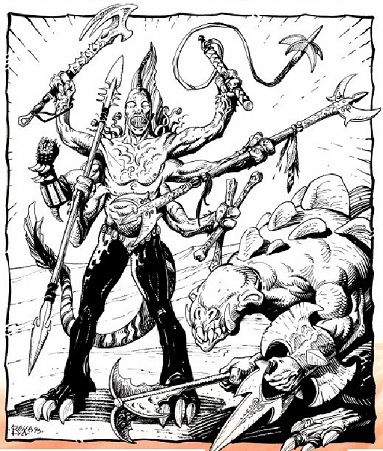 Even though Brom's color work in Dark Sun is unsurpassed, Baxa's black & white depictions of Athas are the best, even though he also worked in color, and it's also very, very good. 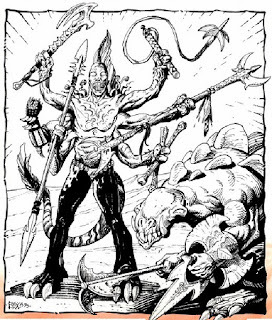 To me, Dark Sun and Baxa will always be inextricably linked.